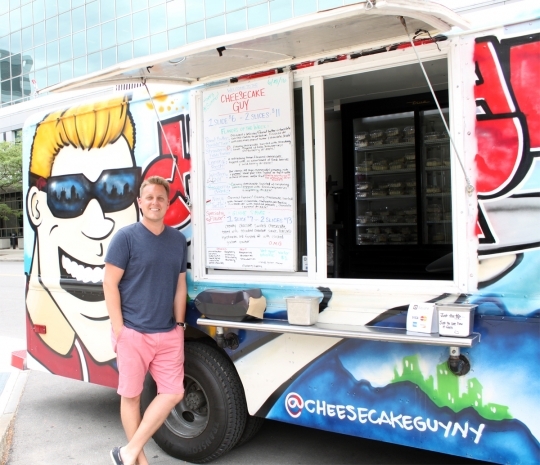 A year later, Matthew’s food truck business, The Cheesecake Guy, is a prominent part of Buffalo’s growing food truck scene. Matthew was attracted to the idea of a food truck because of its low operating overhead—all he needed was a commissary and a vehicle—and because he liked the idea of bringing his product directly to people. He decided to sell cheesecake because he thought it would be unique. Plus, he had his family’s popular recipe. “There’s a small number of dessert trucks in Buffalo,” he explains, “and I thought if I did this one thing well, rather than trying to do five or six different things, it would draw a following. It took 10 months to get the vehicle ready for its debut on April 16. Equipped with two refrigerators and a prep table, the colorful box truck features a caricature of Matthew, the Buffalo skyline, and slices of cheesecake, hand-painted by freelance graffiti artist Ryan Smith. Matthew’s menu is a collaboration of ideas, as well. Starting with his family’s recipe, Matthew adds ingredients and toppings to amplify the flavor of the dessert. Many of the flavors—he has about three dozen—are inspired by the way breweries and coffee shops infuse their beverages, he notes, such as orange chocolate swirl and pumpkin spice. Others are based on food pairings, like French toast with bacon, or apple cinnamon swirl. He’s recently tested a strawberry swirl topped with jalapeno lime balsamic vinegar. Matthew makes everything from scratch, baking between 45 and 60 cakes on Mondays each week in a kitchen he rents from a local church. It’s about a 10-hour day, he says, but he has a “great team of helpers,” including his parents, who drive from their home in Canandaigua, his wife, his sister-in-law, and his niece, who also assists with sales. Tuesdays through Sundays, Matthew hits the road with his edibles, setting up at office parks and special events throughout Western New York. He’s also participated in a beer and cheesecake-pairing event at 12 Gates Brewing Company in Williamsville, N.Y.
From the beginning, the response has been “joyously overwhelming,” he says. “The first time, we went out to an office park in Amherst, and there was a line of people. I was blown away! Everyone said (the cheesecake) was fantastic, it was the best they ever had. Right there, I knew we got to the point we needed to and that people were going to love it. Encouraged by the favorable response, Matthew is starting to make plans for the future of his business. He’s already thinking about doing a second truck in the Buffalo area, this time featuring a sketch of his wife as The Cheesecake Gal, and would eventually like to open a storefront where he can offer flights of his cakes with various beverages. He’s also considering operating trucks on the West Coast and in Florida, but notes that even if his business expands to these warmer weather climates, he would always return to Western New York, and the family that supported him and helped him realize his dream. To find out more about The Cheesecake Guy and upcoming locations, visit https://cheesecakeguyny.com/.